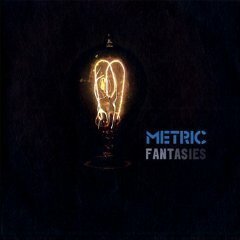 I love the new Metric album “Fantasies”. If you want, I suppose you can skip reading the rest of this article, but if you like synth pop/rock influenced by the 80’s and Weezer, you’re going to want to read on. I guess Metric is old news. “Fantasies” is their fourth album but they’re new to me! It’s hard to clearly define the “sound” of this album. Their lead singer Emily Haines has a light, feminine voice which makes the sometimes visceral lyrics really stand out. For example on the song “Sick Muse” her airy voice sings “Watch out Cupid, Stuck me with a sickness, pull your little arrows out, let me live my life.” The accompanying music is low, guttural guitar, and yet it comes around to a chorus that could have been written by Rivers Cuomo (Weezer) for all of the pop perfection that it embodies. In fact, the whole album dances the line of rock and pop quite well. Some songs like “Stadium Love” are straight up, Weezer-esque pop/rock tunes, others such as “Twilight Galaxy” lean heavily on the synthesizer sound, and yet others like “Gold Guns Girls” are female fronted rock and roll excellence. Lyrically, these songs are not telling stories, they are conveying emotions. I mean this as a complement, but this album would make an excellent soundtrack to any drama on television, particularly a police procedural. If I was involved with the television show “Life” (which is great, by the way) I would be securing the rights to use the whole album. Maybe you won’t hear it when you try out the album, but it’s something that struck me after repeated listening. Unfortunately there isn’t a music video for their song “Help I’m Alive”, which was the song that got me to pick up the album. However, I did find this nifty documentary clip about Emily Haines writing the song! Enjoy!